The Bi-Vis Tadpole is a cracking tadpole pattern for days when daphnia have badly coloured the water and trout are reluctant to feed on anything else. Its bright colour shows up well in these murky conditions. To maintain the best contact with the fly, keep the rod tip low and no more than 300 mm (1 foot) above the surface of the water, and the rod pointed straight along the line of retrieve. Thread : Spraton fluorescent orange. 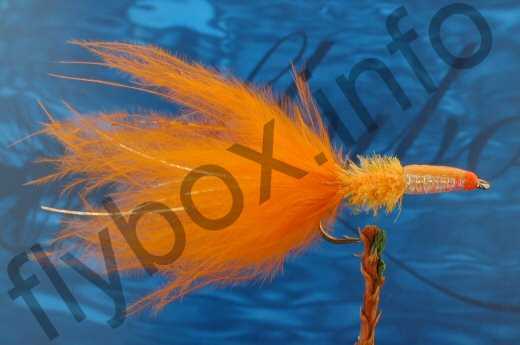 Tail : Hot orange marabou, overlaid with four or five strands of Spirit River holographic gold Maylar Motion. Abdomen : GEM bi-visible orange chenille. Thorax Cover : Hot orange antron floss. Thorax : Spraton fluorescent orange thread overwrapped with medium or wide pearl tinsel. Head : Build up of Spraton fluorescent orange thread. Tie the tail long. Drennan 2X Traditional Wet. Currently there are no comments about the Bi-Vis Tadpole fly pattern from other fly fishermen yet.